Snap Fitness Center offers massages to their guests as a new feature. However, the only space available for a massage is their training room. Since they rent the facility, the fitness center is unable to build permanent walls. Therefore, they began to search for a cost-effective and practical solution to creating the needed privacy for their guests. 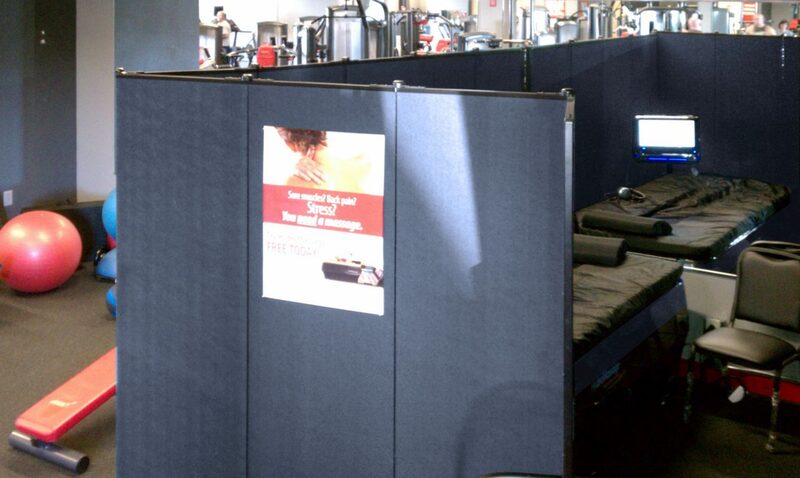 After researching several options, Snap Fitness choose Screenflex Portable Partitions as the best fit for their needs. The center remarked how impressed they are with the self-leveling caster wheels that maintain a level unit. Additionally, corner casters lock to secure the unit in place. But most of all, the walls can be formed into any shape the fitness center desires. Here, two seven-panel units are locked together with an optional multi-unit connector to create one continuous wall. To find the perfect room divider for your space, visit screenflex.com to view our 38 colors and 36 room divider sizes.